Be the first to share your favorite memory, photo or story of Doreen . This memorial page is dedicated for family, friends and future generations to celebrate the life of their loved one. 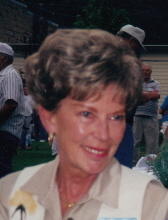 Doreen Ann Terrill of Hayden, Idaho passed away at Hospice of North Idaho on Thursday, December 27, 2018 at age 86. Doreen, born April 3, 1932, was a native of Mullan, Idaho where she was raised by her parents Daniel Leppala and Katherine (Jutila) Leppala. She received her primary and secondary education through the Mullan school system with excellent academic performance. During her high school years, Doreen met and began a dating relationship with a fellow student, Jim Terrill. By the time Doreen graduated from high school in 1950, they had become "high school sweethearts". Doreen enrolled at the University of Idaho, which she attended for two years with a major in Secretarial Studies. Meanwhile, her high school "steady" joined the military service in 1951 as the Korean War was strongly underway. When Jim returned to Mullan on a 30 day furlough prior to shipping out to Korea, Doreen and Jim became engaged. Doreen put together all of the wedding plans while she waited patiently for Jim's safe return. Her planning was flawless and it all came together beautifully when they were married on January 4, 1954 at a church service in Mullan. After Jim completed military service, Doreen and Jim moved to Moscow, Idaho, where Jim enrolled at the University of Idaho. Upon his graduation in 1959, the couple embarked on a 35 year career in the corporate world. As her husband climbed the corporate ladder, Doreen provided strong support at industry business meetings and social functions, as well as developing strong relationships with company employees at their corporate business and social affairs. They moved often as they assumed various company assignments: 8 years in Dallas, 6 years in Chicago, 4 years in Portland and 17 years in St. Louis. Retirement arrived on December 31, 1996. Knowing they would settle down back in North Idaho, Doreen was intense in the house hunting efforts. They purchased a home on Lake Coeur d'Alene, as well as winter quarters in the Tuscon, Arizonaa area. In the late years of her life Doreen developed a strong focus on her hometown of Mullan, this being where she learned the values and disciplines that guided and supported her during her entire life. This focus brought about creation of a number of community projects to enhance quality of life in her small hometown. The annual "Christmas for Kids" and the city park improvements were among her favorites. Doreen leaves behind many close friends and relatives: Husband Jim Terrill, sister-in-law Christy (Terrill) Rude, and literally "cousins by the dozens" including first cousins: John (Charlotte) Jutila, Doug (Elaine) Jutila, Gary (Sharon) Jutila, Keith (Diane) Jutila, Nancy (Doug) O'Brien and Bob (Gloria) Oja. Church services will take place on January 12, 2019 at 10:00 A.M. at the Emmanuel Lutheran Church in Mullan, ID located at 2nd Street and Terrill Loop. To send flowers or a remembrance gift to the family of Doreen Ann (Leppala) Terrill, please visit our Tribute Store. "Email Address" would like to share the life celebration of Doreen Ann (Leppala) Terrill. Click on the "link" to go to share a favorite memory or leave a condolence message for the family.